This morning, a free pattern to add to the collection of hand embroidery patterns here on Needle ‘n Thread! 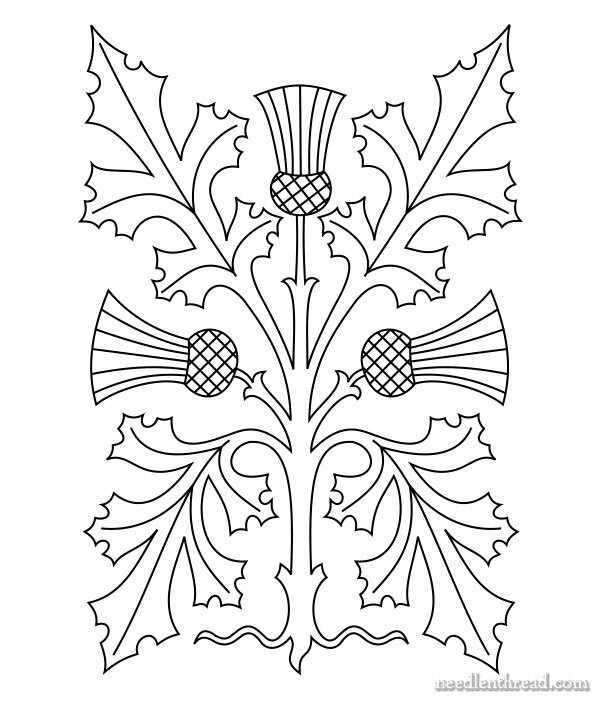 This one is a highly formal, stylized thistle. I love thistles in hand embroidery – there are so many ways they can be embroidered! I’ve seen puffy, hairy thistles, worked in turkey work; I’ve seen needle painted thistles in long and short stitch; I’ve seen thistles worked with very long chain stitches, like the one in Breath of Spring; thistles worked with pistil stitch, and thistles worked with very effectively with plain old straight stitches. Lots of options! The formal aspect of this design lends itself well to silk shading, to goldwork, or a combination of both. With a little ingenuity and creativity, whitework and even blackwork could be an option. Enlarged, it could make a nice appliqué design for a quilt. And of course, crewel work would be a good choice for this design, too! I’ve received a few emails lately asking if I can please provide color, thread and stitch guides for the patterns I post. Well, as much as I’d love to be able to do that for each pattern, the time involved in preparing color and stitch guides is tremendous! I provide the patterns so that you can play with them and discover your own interpretations. Think of it as the challenge of finding your own way on an exciting journey while creating your own unique work of art! If you’re looking for other hand embroidery patterns – perhaps something a little less formal? – you might enjoy browsing through the free hand embroidery patterns here on Needle ‘n Thread! July 16, 2013 Mission Rose: Applique Finished! What’s Next? What a pretty design. I know alot of folks think of Scotland with the thistle, but for me, it brings back fond memories of my horse when I was in high school. Yes, I was “one of those girls” that loved horses from the time I could talk and finally got one when I was about 16. Of all things there was nothing (other than apples) that she loved better than… a thistle flower!!! If we saw one, no matter where it was we HAD to go and get it, thru the weeds, ditches, etc. LOL. So, thistles always remind me of my first love. 🙂 Thanks for the smile this morning, Mary. I do adore thistles. But I’d love to see a picture of this one stitched up. How do you handle all the tiny dips and curves on the leaves? I have no idea how people can make all those pointy ends look neat. If anyone stitches this one, it would be great to see a picture posted. Irene, I just found a beautiful embroidered thistle on Pinterest, stitched by Margaret Dier. It isn’t quite as stylized as this one, but she did some GORGEOUS shading, and the deep curves and sharp points are perfection. You might want to hop over to Pinterest and give it a look! Thank you Mary. I love making my own decisions on the color choices and techniques/stitches. Even if it doesn’t come out quite to my satisfaction, the process of making those decisions is, for me, great fun and a good way to learn. I’m currently working on your Tulips & Carnations design using some silk Dupioni I had on hand (from the past) and silk threads from my stash. It’s definitely a challenge making all those decisions. One moment I love it, and the next I’m thinking OH NO! I like this new design. Maybe I’ll try that one next. But I think I’ll be busy with the first for some time. Glad you like it, Pat! I think it’s fun to make my own decisions on colors, stitches, and so forth, too. But I have to admit, sometimes, it’s just nice and relaxing to follow someone else’s lead! That’s why I like indulging in kits now and then, too. I’d love to see your tulips and carnations when you get them finished. I love that pattern, and One Of These Days…! (I always say that – I’d have to live ten life times to get through my One of These Days List!). I like the Stylised Thistle pattern and as you say there are so many ways to embroider this kind of pattern. When I am using one of your patterns I think it is better to create your own embroidery style choosing your own colour threads and choosing your own stitch guide. There are so many stitch guides to choose from and so many different threads you can use which makes the choice so much more exciting. Thanks for sharing the free pattern and for advising on what stitches would suit this pattern. Have a good weekend. It’s springy here some days the sun is shinning. Hope you have a good weekend. Dear Mary, of course I’d be happy to share a picture of the tulip & carnation design when I’m finished with it (will be a while). I wouldn’t be working on this if you hadn’t shared it with all of us. I hope it won’t be disappointing; I am not up to your level of expertise. Surface embroidery is pretty new to me, but I absolutely love it, love the freedom. I’d be honored to have you look at it when I’m finished. Now I have to make sure I finish and make it come out as good as possible. Thank you again. Formal yet really beautiful. I think it’s great to chose the threads and colours too, although it can be daunting to get colours right sometimes. Have you done any posts on combining colours? Thank you for the pattern Mary! Thistles are a favorite. It a very pretty stylized thistle but the more I look at it the more I want to change it. Id drop the bottom 2 leaves, make the thistle green head part longer and the flower head shorter. Id also shorten the stem part and thin out the leaves. Its not that the pattern is a wrong just it inspired me to make it more thistle like.